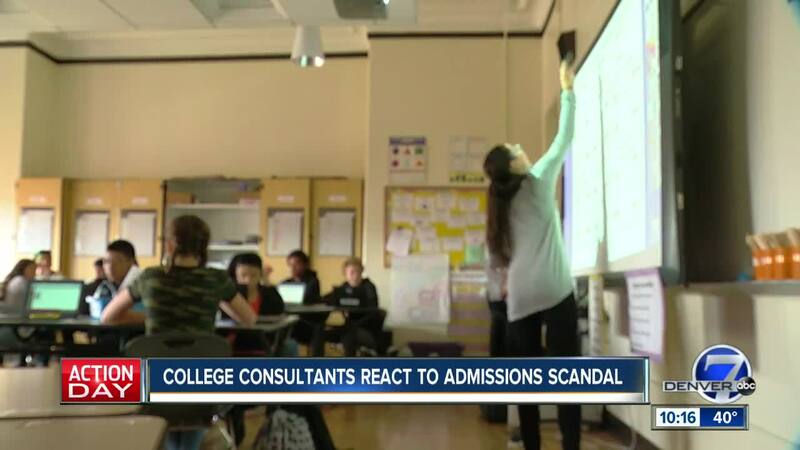 DENVER -- The college consulting industry feels the admissions scandal has given people misconceptions about their business. Demand for college consultants has grown over the yearas and it’s a $2 billion industry that is perfectly legal. Karen Herbst runs Admission Intuition in Denver. Her company advises students on essays, applications, standardized tests and even what classes to take in order to prepare for college. "I work with families and high school students to help them navigate the college admissions process, so we find colleges for students that are really great academic, social and financial fits," Herbst said. Her industry has come under fire since the Department of Justice charged 50 people earlier this month alleging parents paid hundreds of thousands of dollars, and in a few cases millions, to fake test scores and have prospective students gain admission by falsely claiming they were athletic recruits. "There was a bad apple college consultant who seemed to be the mastermind of the whole plan," Herbst said. "I don't think he's representative of the industry, I don't think he defines college counselors. I hope people know that." She believes the frenzy and competitiveness surrounds the top 20 colleges across the nation, telling Denver7 college consultants aren’t there to stretch the truth, but help students let their achievements shine. "A big part of the process is managing expectations and finding best fits for a student, as opposed to just looking for the school that is the hardest to get into," she said. Many college consultants Denver7 spoke to said it’s a myth their services are just for the wealthy. They work with students of all backgrounds and a big part of their services are helping them sort through financial aid options. But hiring a college consultant is still a luxury for many families. Firms can charge anywhere from a few thousand dollars to tens of thousands of dollars. The industry may be just another example of how the entire education system benefits wealthier students. "Of course it can be unfair when some students have this advantage,” Herbst said. “I know that a lot of independents will do a lot of volunteering work. We try to keep our eye on that, but there are a lot of disparities in our education system that already exist that are even more worrisome."